Each of our bucket filter systems utilizes .01 Hollow Fiber Membrane technology and removes all harmful bacteria and cleans your water to 99.99% pure water. There is no need to drink contaminated water. Our filters are long lasting water purification filters, capable of providing clean water suitable for drinking and cooking; easy to use; easy to maintain. Each filter is certified for ABSOLUTE microns; that means there is no pore size larger than 0.1 micron in size. This makes it impossible for harmful bacteria, protozoa, or cysts like E. coli, Giradia, Vibrio cholerae and Salmonella typhi (which cause Cholera and Typhoid) to pass through the.01 Hollow Fiber Membrane biological filter. 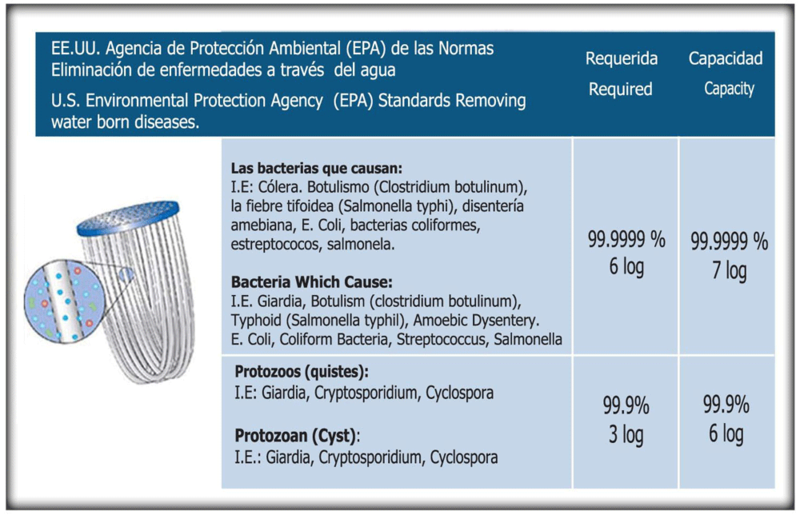 At 7 log (99.99999%) the filter attains the highest level of filtration available today.